I wanna be a taiko drummer. What a thrill it must be to carry a big stick, hit something as hard as you can, and make a beautiful noise with your friends. It certainly is a thrill to be in the audience and experience all that wonderful energy coming from the stage! 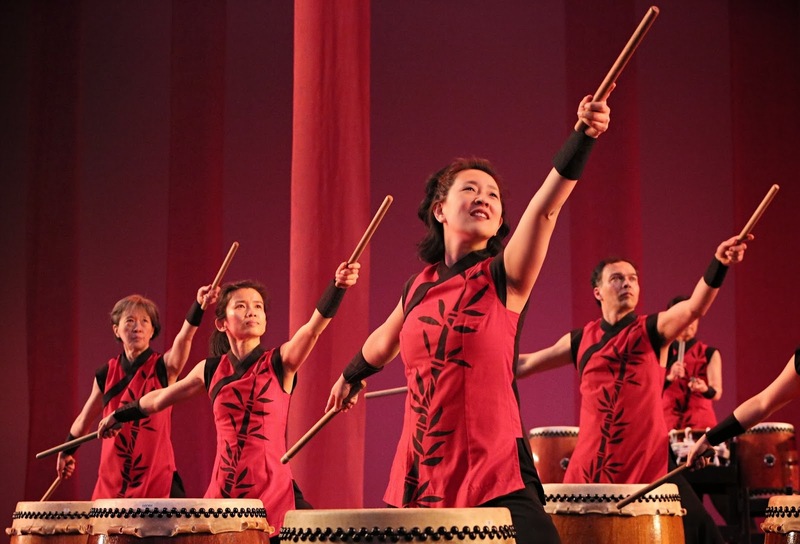 Mu Daiko, the drumming ensemble part of Mu Performing Arts, presented their seventeenth mainstage production at the Cowles Center this weekend. I've seen them perform several times over the past few years, and they never cease to absolutely thrill me with their precise rhythms and gracefully powerful choreography. You owe it to yourself to see them perform at least once; it's a thrill that engages the mind, body, and soul and leaves you feeling invigorated and energized (perhaps not the best choice of performance for the night before the time change!). The eleven-member ensemble (including two interns) presented twelve pieces in two acts, composed by Mu Daiko Founder Rick Shiomi, Artistic Director Iris Shiraishi, and members Jennifer Weir, Heather Jeche, and Craig Schultz. As difficult as it must be perform, I cannot imagine all that goes into composing one of these pieces, not just creating rhythms and dynamics for multiple instruments, but also the intricate choreography that accompanies each sound. Instruments include multiple sizes and types of drums, flutes, and stringed instruments. Some pieces are quiet, still, and graceful, some are fun and playful, and some are explosive. Sometimes the entire ensemble is onstage, sometimes just four drummers. It's a really nice variety and I appreciate all of the pieces, but it's the loud and fast ones that are the crowd-pleasers and really get the blood pumping. In the final number, composed by Jennifer Weir, drummers sit on the floor and lean back while pounding on the drums, in what must be the best ab workout ever. By the end of the song they are all grimacing and shouting, in pain or ecstasy or both. A fantastic ending to a wonderful display of music, dance, talent, and artistry. my abs hurt just watching this! A lovely feature of this concert is that all nine full members of Mu Daiko spoke a little bit about how they started with taiko and what it means to them. It was truly inspirational to listen to their different stories, most of which started with "I went to see Mu Daiko perform, took a class, and was hooked." They spoke of a deeper connection with fellow members and the audience and oneself, an exchange of energy, and the rewarding challenges to mind, body, and spirit. 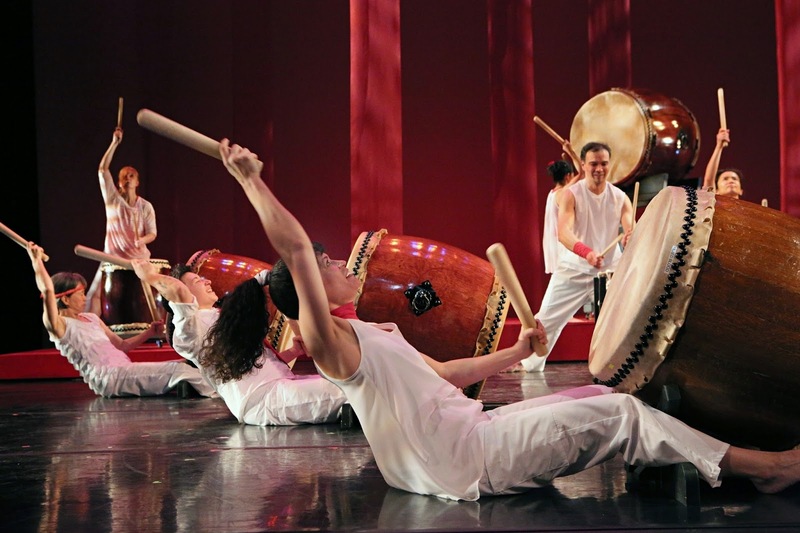 A taiko drumming performance is not out of place on a theater blog. There are quite a few theatrical elements. While there's no story per se, each piece is built around a theme or idea, and the drummers are actors too, almost playing characters as they egg each other on and toss the rhythm back and form. They most definitely are dancers, not just in the perfectly synchronized movements of the drumming, but also in the traditional dancing that accompanies some of the songs. The lighting is theatrical, as are the costumes - the traditional red and black uniforms in the first act (and these strange sock/shoes that look like cloven hooves), and the modern and individual white clothing with a touch of red in the second act (barefoot!). It's so much fun to watch this wonderful ensemble as they work and play together, and see the expressions on their faces. 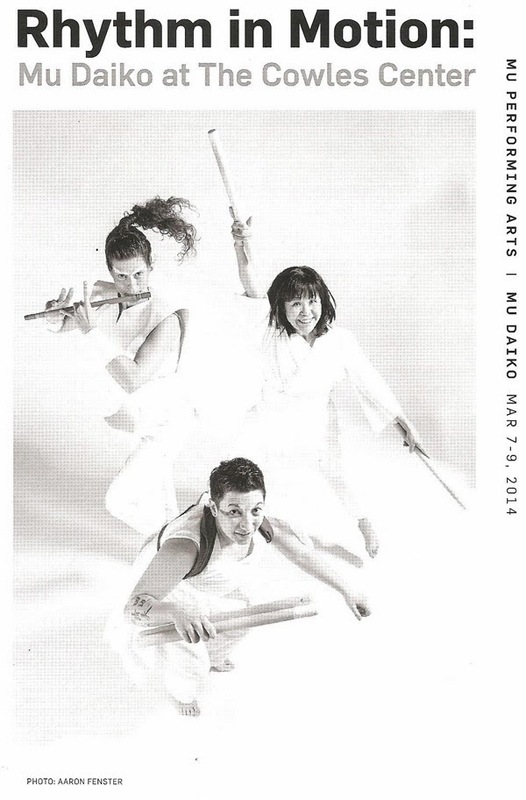 In particular, it gives me so much joy to watch Jennifer Weir, an original member of Mu Daiko. She is a great example of a true artist lost in her art, in the creativity and expression and sharing with others of her talent. What she and all of the members create in that space is truly a thing of beauty. Unfortunately the performances of this concert are over, but check their website for future performances and for information on how you, too, can become a taiko drummer!